I went on this website where it gives you random emojis. With that emoji prompt I am going to write a story. My emoji prompt is above. To get your own emoji prompt click here. To start click "and then". To create your story emoji prompt keep clicking "and then" in till you think you have the perfect story prompt. If you don't like your emoji story prompt click start over. I grabbed my case and flew out of the house. I was determined to practice. I ran to the side walk and saw the weirdest thing. A chicken was crossing the road. I grabbed my trumpet from my case and started to play. The chicken ran back and forth across the road as if it was dancing a strange dance going left to right, left to right. Just then I realized that the stop light a little ways down the road turned green. A train was coming straight for the chicken. I had to act fast! I took my trumpet and blew the loudest note I could play. The person driving the train got my message and came to a stop. I quickly scooped up the little chicken. I went home and told my Mom what happened. She was so happy I saved the chicken's life that she said I could keep the chicken and took me to In-N-Out. I got fries. Now it has been three months, and I care for my chicken as if it was my baby. I play my trumpet for the little chicken I named Little Trumpet after the thing that saved his life. Translate the following. If you figure out write the answers in a comment. 👋 reader. Do ➡️👤 💡 how 👤📖 emojis? If ❌️ by the ⏱️ ➡️👤 finish translating this ➡️👤 will 💡. Now that ➡️👤 💡 how 👤📖 emojis better than ➡️👤 did before doing the 🥇 problem. The translating is ➡️ to get harder. For numbers 3-5 try to figure out what movie I am writing in emojis. For numbers 6-8 try to figure out the book I am writing in emojis. For numbers 9-12 try to out the music group I am writing in emojis. Don't forget to write your answers in the comments. Here are some emoji math problems. Can you figure it out? Write your answers in the comments. For numbers 1-3 write the numbers represented by the emojis. For numbers 4-6 write the answers using the information from problems 1-3. When you find the answers don't forget to write them in the comments. This is my emoji art. It is a emoji of me. I made it with the Made With Code emoji project. It is very fun. You get create a emoji of yourself and code at the same time. My emoji is based on me. It has brown hair like me. Moreover, My emoji is wearing a purple shirt and mostly everything I own is purple. Additionally, my emoji is winking. This is like me because I wink all the time. I think it is so much fun to wink and be silly. Furthermore, my emoji is holding a painting palette and I love art. 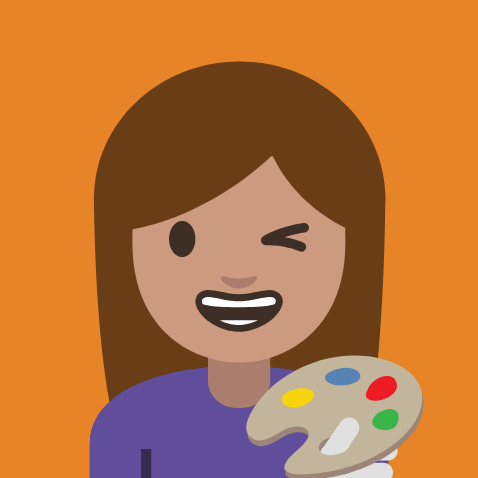 Art is one of my favorite hobbies, so I think it is amazing that I got my emoji to hold a painting palette. Lastly, I think you should try to make a emoji of yourself too. It is so much fun to make and it is very cool to see your self as an emoji! Thank you so much for reading my post. I hope you learned about what fun things you can do with Emojis. Commenting is all about expressing your opinion. When I look at blogs I think about what I liked about the blog, what connection I have to the blogger or the topic the blogger is talking about, and what questions I have about about their blog post. In my comment I include all of this factors to make it a good comment. Moreover, I visit blogs often and most are very wonderful. I comment on many of the blogs I read. Below I have listed some blogs I have visited, the comments I made on their blogs, and why I left them a comment. If you click on the name of each blog in this post there is a link that will take you to their blog. Sabina's All About Me page: I commented on Sabina's blog because Sabina is a great writer who wrote an amazing All About Me page on her blog. She wrote her post in a positive way that made her post sound very cheerful and happy. I like your writing style. You write in an up-beat way which makes your writing really exciting. In your post you said you love animals, I do too. Have you ever thought about being a veterinarian will your older? Moreover, you said in your post one of your favorite colors is sunflower yellow, I like that color too. I like how the color sunflower yellow is bright and cheery. It reminds me of a warm, sunny, and happy day. Furthermore, you said you like traveling, but not by plane. Why not? I for one, don't really like planes either, but that's because I get really bored. Is that why you don't like planes? Lastly, I have a blog too. If you would like to visit it, here's the link https://morgank1.blogspot.com/. 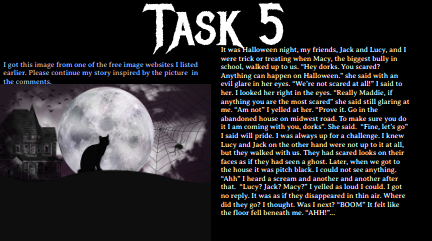 Bail's Blog: I commented on Bailey's blog because her All About Me post was very interesting. She showed her excitement for blogging and put who she was in writing. I think it is a great post. I like how you showed how excited you were in your post. It made your post up-beat and awesome. I really liked reading it. In your post, you said you like music, I do to. I play the trumpet in my school band and it's really fun. I saw you listed most of the instruments you play, but how many do you play in total? Moreover, you said you take horses and cows to a county fair, that is amazing. I have never been to a county fair. Is it fun? What do you do there? Furthermore, you said you are the youngest in your family, I am the youngest in my house. I have a older brother. Lastly, I also have a blog. If you would like to check it out here is the link https://morgank1.blogspot.com/. Taylor's Amazing Blog: I commented on Taylor's blog because her All About Me post was very unique. She wrote all about herself in an incredible poem. The post shows who she is and the amazing talent she has. I like your All About Me post. I think it is very cool that you put the post in a poem. In your post you said you love art I do too. I like to create anything out of everything. Is that how you do art? Moreover, you said that clowns make you frown. I know how you feel, clowns can be creepy. Furthermore, you said you love to see the sea, I do too. I like how the waves dance. Additionally, you said when you have the food you love nobody else compares. What is your favorite food? Lastly, I also have a blog. If you want to see it here is the link https://morgank1.blogspot.com/. Overall, I think these blogs were amazing. It was an awesome experience to comment and explore on their blogs. I hope my comments showed the bloggers that they have incredible blogs and that they did a great job. These are the steps to comment on my blog. Scroll down to the post you want to comment on. Click on where it says how many comments there are for that post. For example, if it says"1 comment:" you would click on it. On your screen you will see other people's comments on that post and a comment box. Click on the comment box. You will then enter your comment. If you want to be notified click the box next to where it says "Notify me". If you want to preview your comment click the white preview box. To publish your comment click the blue publish box. This is how to write a good comment. In your comment write what you liked about the post not what you didn't like. Write with correct spelling and punctuation. Capitalize the first word of every sentence and the word I. If you ask questions then I can answer them and we can have a conversation. For example, if you see that I say my favorite color is blue and your favorite color is blue to say that in your comment. For example, if you know about the topic I'm talking about you can write more information about it. Write your comment just like you write a letter. Have a greeting like saying hi. Have closing like saying bye or sincerely and then your name. Never put your personal information in a comment or online at all. Putting personal information online is not safe. You never know who will see it. 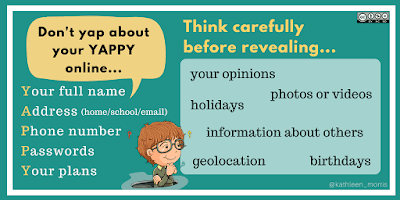 "Don't yap about your YAPPY online" is a great guideline to know what and what not to share online. Make sure to read your comment when you are writing it to check for mistakes. If you write a comment here's what I would like to know about you. 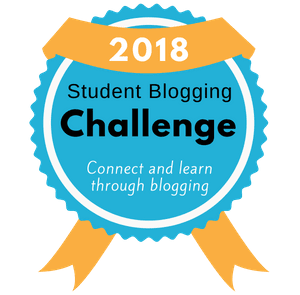 Are you doing the 2018 blogging challenge? 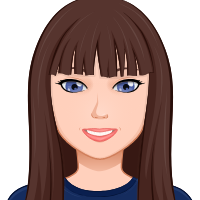 Cartoonify is the avatar creator I used to make my avatar. My avatar represents me in so many ways. First, my hair is brown in my avatar. I have brown hair in real life just like my mom and dad had when they were my age. Next, my avatar has bangs. I have had bangs since I had hair and I really like them. Furthermore, my avatar has a blue shirt on because my favorite color is blue. Moreover, my lips are pink because I love to wear pink lip gloss. Lastly, my avatar has a big smile like me! I love to smile and be happy. The 2018 Blogger Challenge is going to be so much fun! I am looking forward to being part of it!